Anyone who knows me, knows how much I love David Bowie. A while ago, I came across a David Bowie graphgan which I had no idea how to use but… I copied and put safely away. Out of sight. Out of mind. Until I remembered it and wanted to make sure I still had it. But wait! What is this amazing piece of equipment sitting on my desk? Ah yes! I have a computer with a search engine in it that can look up things! Low and behold look what I found! 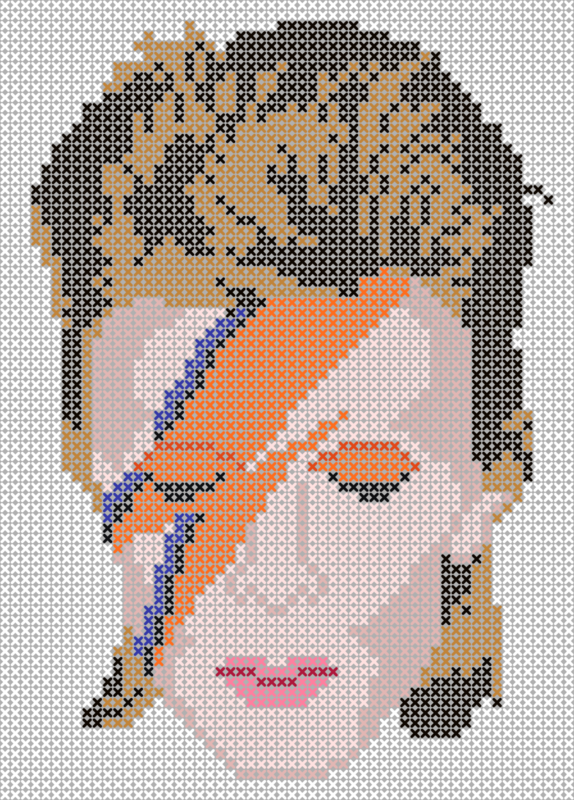 A portion of the Bowie graphgan I found online. I’m only showing a portion of the photo because I don’t own it. This is the link you can use to see the entire Bowie graphgan. I still don’t have a proper credit for this though. If it’s yours please let me know. Thanks! Anyway, now that I found it, I have to decide how I want to recreate it. I imagine this was intended as a cross-stitch pattern but since I don’t do cross-stitch, I’m thinking I can make a blanket out of it with either a corner-to-corner (c2c) stitch or make a bunch of granny squares in the right colors and pixelate it. I’ve got time because I’m planning this as a mid-winter project, as in… after Christmas. 21 Times David Bowie Was Immortalized in Yarn by Knitters, Crocheters & Fiber Artists – PATTERNS! Well worth a look if you’re a Bowie fan like Me! And now, after visiting there, I have several other projects that I want to make! Wow…that is so fabulous! 😍 That will be so much fun to see grow. I’ve never done that but now I will look into it. Thanks! I think sc is the best way to mimic a cross-stitch. Thank you for the David Bowie fix. I needed that. Can’t wait to see what you do with the graphgan. That is going to be so cool! I love Bowie too! Thanks for the link to the Bowie immortalized in textiles page!